Tomatoes and cucumbers appear to grow just fine—and just as healthily—in smart, solar-powered greenhouses that capture solar energy for electricity. Scientists from the University of California, Santa Cruz, have shown how crops can grow as healthily in these new greenhouses as they do in conventional greenhouses. “We have demonstrated that ‘smart greenhouses’ can capture solar energy for electricity without reducing plant growth, which is pretty exciting,” Michael Loik, professor of environmental studies at UCSC, said in a press release. Loik is the lead author for the paper, published in the American Geophysical Union’s journal Earth’s Future. Bright magenta panels cover the tops of the greenhouses, soaking up sunlight and transferring the energy to photovoltaic strips. From there, electricity is produced. The greenhouses are able to take sunlight for energy and leave the rest, allowing plants to grow using a technology called Wavelength-Selective Photovoltaic Systems (WSPVs). The technology, developed by co-authors Sue Carter and Glenn Alers, is less expensive and more efficient than traditional photovoltaic systems. The team tested the growth and fruit production across 20 varieties of tomatoes, cucumbers, lemons, limes, peppers, strawberries and basil at two locations at the Santa Cruz campus and one in Watsonville, California. 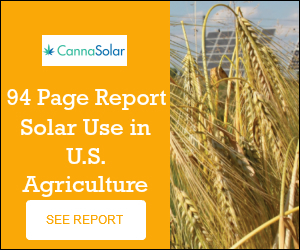 Scientists reported that 80 percent of the plants were unaffected by the slightly darker lighting from the magenta panels, and 20 percent of the crops grew better. Tomato plants needed 5 percent less water under the magenta panels. Reducing the energy used in greenhouses is crucial since the use of greenhouses to grow food has increased by sixfold in the past 20 years, according to Loik. Solar-powered greenhouses are one of several developments for new ways of farming in recent years. Another company, NatureSweet, has outfitted its greenhouses in Arizona with artificial intelligence, reported CNN. The plants are monitored with 10 cameras installed in the greenhouse ceilings which continuously take photographs to detect insect infestations or dying plants. The software, developed by a company called Prospera, recognizes those problem spots and sends feedback 24/7. Previously, reported CNN, NatureSweet’s employees walked through the greenhouse in order to spot issues with the plants. Green roofs are another method of growing food in an attempt to utilize space and close gaps in access to foods in urban areas. In Washington, D.C., Up Top Acres has opened five urban farms on the rooftops of buildings since 2015, reported Washington City Paper. Green roofs improve storm-water collection, habitat protection and energy preservation, in addition to providing food. The company’s co-founder, Kathleen O’Keefe, told the paper that the company may not produce enough food for the city, but green roofs can change the way people think about food, in addition to utilizing unused space.